Establish your goals and objectives – An Opening interview to assess your current financial situation and to identify your priorities and concerns. 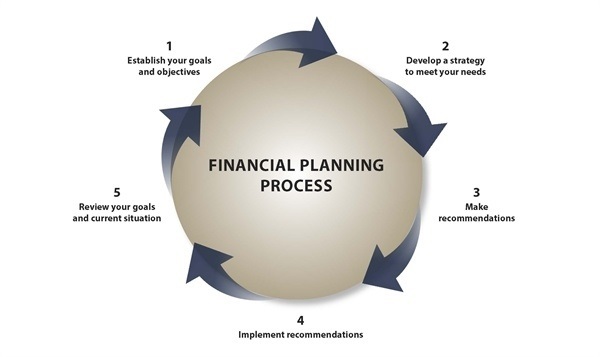 Develop a strategy to meet your needs – gathering information to develop a profile of your current situation, including a review of your financial information and relevant documents. We will analyze this data to be certain we understand your unique situation and how to address it. Make recommendations – presenting the planning analysis during a strategy session allowing you to understand where you are in relation to where you want to be in the future. Implement recommendations – using the plan as a blueprint, develop an implementation schedule and identify specific products and services to help you reach your goals. Review your goals and current situation – The last step in the process is the periodic review of your financial situation. At a minimum, we recommend you assess the need for any changes annually. Even the best financial plan must be monitored on a regular basis to make sure you are continuing in the right direction.